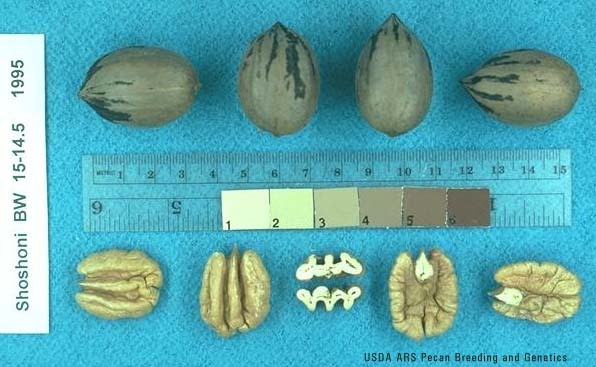 ID was by the appearance of the nuts and kernels of the 2018 production in our barnyard and that the 1975 report of south Alabama pecans included it as the only little round nut that looked just like ours. Below was extracted from here. ‘Shoshoni’ is a selection from an ‘Odom’ x ‘Evers’ cross that was released in 1972 by the USDA. ‘Shoshoni’ is a precocious cultivar that is a heavy yielder. Harvest date is relatively early, averaging in the first week of October. The tree seems to be vigorous and is often called a “Moon Tree” because of its strong central leader. The tree seems to have few problems and is an “easy keeper”. Nut shape is very round and size is large. Unfortunately kernel quality is often poor for ‘Shoshoni’. 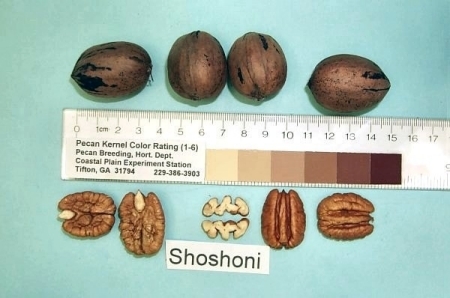 ‘Shoshoni’ tends to alternate and kernel quality is often poor in the “ON” year. Kernels tend to be cup shaped and fuzzy kernels are common. Summer shaking to reduce crop load might improve yield stability and kernel quality. This cultivar is not recommended.